A bus carrying women and children from Slavyansk, including toddlers, was stopped at a border checkpoint by Ukrainian guards. The refugees managed to cross into Russia on foot and find new transport. The incident happened on Friday night at a border crossing between Ukraine’s Donetsk region and Russia’s Rostov region. The bus was carrying people from Slavyansk, the city that has become the scene of constant battles between local militia and troops loyal to Kiev. There were 38 refugees on board, including 21 children aged between 2 months and 12 years, and 17 women, Rostov region spokesman Aleksandr Titov told Itar-Tass. As the vehicle was seized, they went across the border on foot with the help of Russian border guards. “They managed to go through, everyone is alive and well,” the Russian official said. 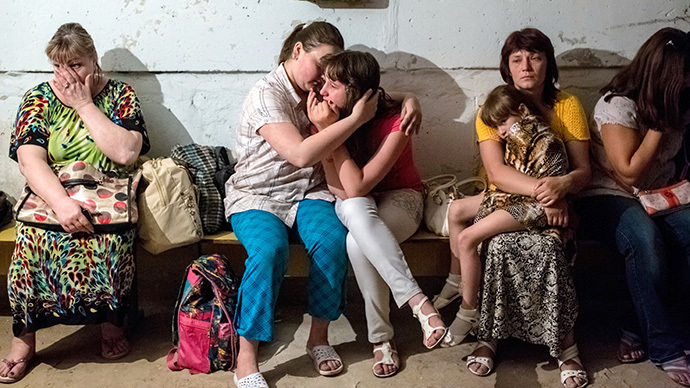 Local authorities housed the Ukrainians in a border city for the night and provided two buses for transportation. 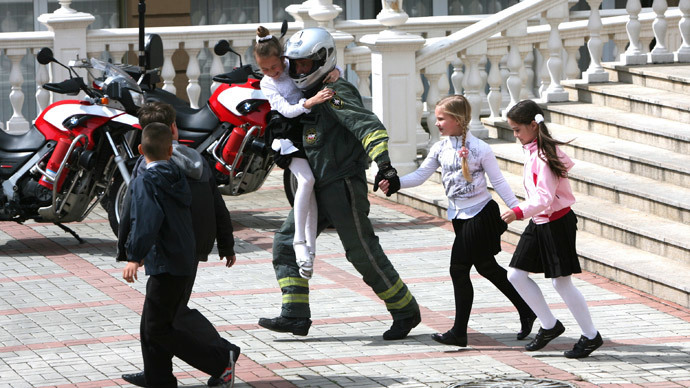 Meanwhile a group of some 200 children from Slavyansk have been evacuated to Russia’s Crimea. The children, aged between 8 and 16, are being housed in various summer camps on the peninsula. Their journey was not entirely trouble free either. On Friday, there were reports that buses carrying the evacuated children were not allowed to cross the border by Ukrainian guards and had to turn back. But now all of them are safe in Russia. RT spoke to some of the kids, who will spend at least a month in Crimea, about how they feel after leaving their home city that has become a battlefield. “The city often comes under mortar shelling. People get hurt as a result. A mortar shell splinter the size of a walnut hit my grandpa’s leg and pierced the bone. If it went a little deeper, it could hit an artery, and that would be it for him,” one of the evacuees, Vladislav, said. “It’s so unusually calm and quiet here compared to Slavyansk. No explosions going off. It was scary. Nobody expected that things like that could start in our city, which was never famous for anything,” another one, Maria, said. “I was very scared. There were explosions. My dad just celebrated his birthday and he was woken by the sound of shelling on that day. I’m very glad I’m here now. It’s calm here,” said Darya, a girl in her early teens. “What was frightening is when a shell flew by your window or you heard shots fired nearby. That’s what frightening,” said a boy called Artyom. 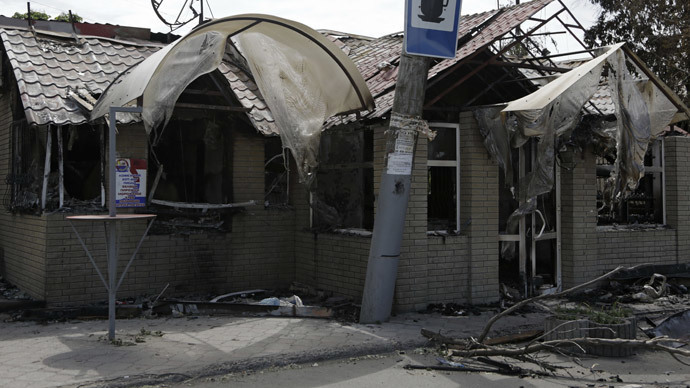 While Kiev’s troops say they are not targeting civilians in their onslaught on the militias, artillery fire regularly hits residential areas in Slavyansk. On Friday morning, several shells hit a children’s policlinic and a hospital in the city. Earlier in the week a kindergarten and a school were damaged. So it’s no surprise that Slavyansk residents want to get their children away from the city. The evacuation to Crimea was used by Kiev to mount some allegations against the self-proclaimed Donetsk People’s Republic. A spokesman for the military operation, which Kiev calls an “anti-terrorist” one, claimed that militia fighters wanted to escape the city under the cover of the humanitarian convoy or stage a provocation. “The kids are in danger due to a threat of provocation on the part of the terrorists. A column with so many children is a target for a terrorist attack. We don’t need a new Beslan,” Vladimir Seleznyov said. Earlier the commander of the operation accused the militia of using civilians as human shields. Kiev authorities have a habit of accusing those opposing them of various atrocities, often not bothering to back them with proof. 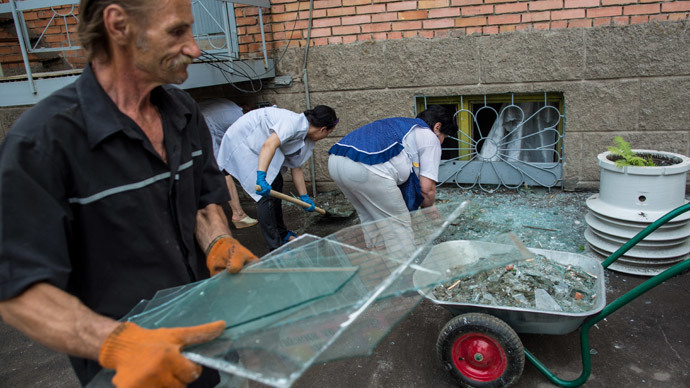 The Friday hospital shelling was also blamed on militias by the Ukrainian troops, who said the self-defense squad in Slavyansk wanted to frame them.